pass time in these cooler months. Hot tea and cookies anyone? I was in the mood to crochet something Fall-ish, and nothing says Fall like a cute little orange pumpkin. These little coasters were so fun to whip up. I made a stack of them while switching back and forth from football to baseball this weekend. Love the little curly vine. 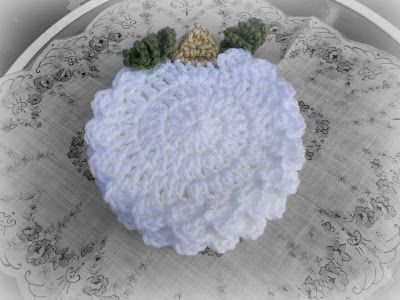 Why limit myself to just orange when pumpkins come in white also. You know I had to make some. How could I resist? All stacked up and looking pretty. Of course I wouldn't let anybody put their drink on these. I would be afraid of getting them dirty. I have an idea for them. But I'm not going to tell you right now. You'll have to come back later and find out. Fun, quick and easy project. If you'd like to make some too you can find the pattern here. They're really cute, and perfect for Autumn and Halloween, I don't think I'd let anyone put a drink on them either! I would love some hot and tea and cookies! Wouldn't it be fun to have a little tea party with some blog friends? That is, unless they turn out to be weirdos! Ha-ha. Your coasters are darling. These would make cute little gifts for Christmas. Can't wait to see what you're going to do with them. Thanks for the pattern link! 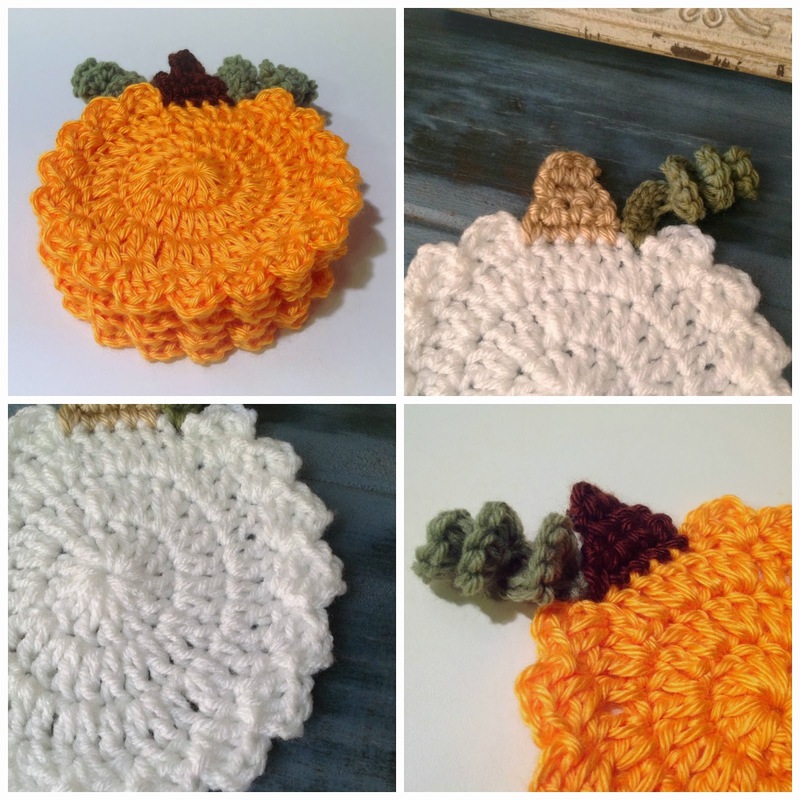 Love the pumpkin coasters..could they be finding there way into bunting? They are super cute and I wouldn't let anyone to put their drinks on them either! Can't wait to see what project you are going to use them for. These are THE CUTEST COASTERS I HAVE EVER SEEN! I am going after that pattern. Thanks! Super cute! Those might be easy enough for me to make. The pattern link is found in the last sentence. Click on the word "here" and it should take you straight there.